eD@HoMe: Wonderful stamps from Gibraltar! 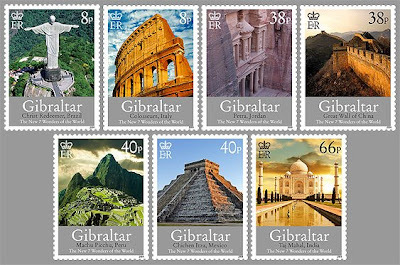 Last week, I received a beautiful set of stamps from Gibraltar. It is a combination of my 2 favourite hobbies; stamps & travelling. The 'New 7 Wonders of the World' stamps were issued on 1st Jun 2008 to celebrate the seven treasures in our world as voted by people from all over the world. More info The origin of the idea of seven wonders of the world dates back to Herodotus (484 BC - 425 BC) and Callimachus (305 BC - 240 BC), who made lists which included the Great Pyramid of Giza, Hanging Gardens of Babylon, Statue of Zeus at Olympia, Temple of Artemis at Ephesus, Mausoleum of Maussollos at Halicarnassus, Colossus of Rhodes and Lighthouse of Alexandria. Only the Great Pyramid of Giza is still standing. The other six were destroyed by earthquake, fire or other reasons. The winners were announced last July in Lisbon, Portugal. The 7 New Wonders are the Colosseum (Italy); Christ Redeemer statue (Brazil); the Great Wall of China; Petra (Jordan); Chichen Itza (Mexico); Machu Picchu (Peru) and the Taj Mahal in India. So far I have only been to 2 Wonders (Great Wall of China & Colosseum). What about you? 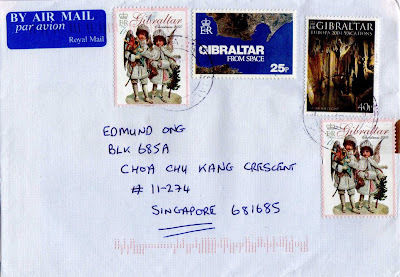 Here is the cover that contained the stamps which I received from Gibraltar. It travelled an estimated distance of 11,628km and took 19 days to arrive. A snail mail from Cuba! A lovely cover from Mauritius! Penny Black; Mother of all stamps! My first cover from Poland! My first postcards from Postcrossing! Aldabra Giant Tortoise FDC from India! My turtle stamps from Philippines! My first cover from Uruguay!